With its eye-catching design, unusual external sound bar solution, combination of high dynamic range and Ultra HD picture technologies plus some impressive all-round performance standards, the TX-58DX802 makes its £1,600 price tag look seriously reasonable. Panasonic is in need of a hit. The introduction of poor-contrast IPS panels into the heart of the most affordable section of the brand's 2016 4K lineup, as represented by its DX600 and DX650 ranges, has resulted in a number of lower recent review scores than the usually reliable brand would expect to receive. The 58-inch Panasonic TX-58DX802, though, looks like it could be just what the doctor ordered. For starters, its design can only be called extraordinary. The screen arrives (in a huge box) hanging between two easel-style silver 'legs', between which you are expected to rest a surprisingly large and hefty external sound bar. As if this wasn't unusual enough, the 58DX802's screen benefits from a super-slim frame and rear, underlining the light, airy feeling created by the easel design. Although I personally like the design a lot (aside from finding the siting of the external sound bar a little clumsy), I can imagine it being a bit much for some tastes. If that sounds like you, though, do note that you can detach the screen from its legs and wall-mount it if you wish. And, even if you decide the 58DX802's looks aren't for you, I consider it a good thing to see a mainstream brand taking on the design-led likes of Loewe and Bang & Olufsen, for a fraction of the price those brands generally charge. Connections, as you'd expect on a relatively high-end TV in 2016, include four HDMIs, three USBs, and the usual LAN/Wi-Fi network solutions. The HDMIs support the latest Ultra HD and high dynamic range content, the USBs let you record to HDD from the TV's Freeview tuner or play multimedia from USB storage devices, and the network options enable you to stream multimedia from DLNA-capable devices or 'surf' Panasonic's walled garden of online services. Powered by the Mozilla Firefox OS, these online services are not as numerous as those found on some rival smart TV platforms, most notably Android TV. However, you do get Amazon and Netflix (in their HDR/UHD forms), plus all the big four UK catch-up TV apps delivered through Freetime, which means you can access catch-up content via an electronic programme guide. And actually I'd argue that less is more where smart TV apps are concerned, given that TVs don't – currently, at least – provide the sort of interface options that really support the easy navigation of hundreds of apps. That's not to say the 58DX802's smart interface isn't a good one, though. On the contrary, I'd rank it second only to LG's brilliantly simple WebOS operating system in terms of its ease of use, logical structure and the degree to which you can customise it to suit your particular needs. 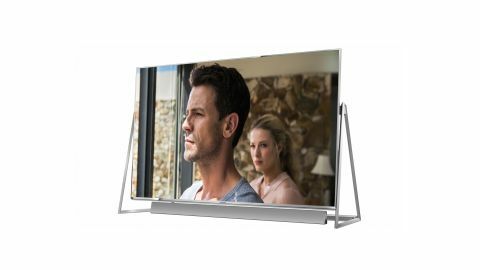 Turning to the 58DX802's all-important picture technology, and considering it sits just one rung below Panasonic's flagship DX902 LCD range, it's perhaps a touch disappointing to find it using edge LED lighting rather than the direct (behind the screen) lighting used in the DX902. After all, direct lighting is consistently proving a more all-round successful backlight option for handling high dynamic range content. The reality is, though, that quality direct LED lighting systems with local dimming don't come cheap. So if the 58DX802 hadn't used edge LED lighting it's safe to say we wouldn't be looking at a price of just £1,600. And it doesn't look as though Panasonic has skimped on the picture quality front elsewhere. Its edge LED lighting system has the ability to dim different sections independently of one another, and this local dimming engine is powered by Panasonic's latest picture processing system, dubbed Studio Master HCX. This isn't the only picture setting Studio Master HCX controls. In fact, it has its tendrils in pretty much every element of picture production, from motion and detail resolution through to managing the Panasonic professional-grade 3D colour look-up table system that impressed so much on its introduction in 2015. The panel in the Panasonic 58DX802 deserves your attention too. Crucially, for a start, it's a 'VA' type, rather than one of the IPS designs that upset us with some of Panasonic's DX600 and DX650 models. This should lead to a big improvement in contrast – which is, of course, an especially big deal when you're talking about a TV that's capable of handling high dynamic range. It's also an ultra-transmissive panel, meaning it can deliver more brightness without increasing power consumption, and its phosphors are designed to handle the wide colour spectrums usually found accompanying current high dynamic range sources. One potential issue is that while the 58DX802's panel can take in 10-bit UHD/HDR signals, the panel itself is only an 8-bit affair. This could have an impact on its colour resolution – although I'm hopeful, at least, that the 3D look-up table system will be working hard to counter this limitation. Also noteworthy is the failure of the 58DX802 to meet the specifications recommended by the Ultra HD Alliance's Ultra HD Premium certification scheme. This is a little alarming, although I personally believe there's a place for non-Ultra HD Premium HDR TVs that still give a pretty strong sense of what HDR is about without costing the earth. Testimony to the 58DX802's picture credentials comes from the fact that it's THX certified, proving that it's good enough to have passed the independent THX group's barrage of tough picture quality tests. The external speaker Panasonic ships with the 58DX802, meanwhile, does much more than just pay lip service to the soundbar idea. It crams in no less than 12 speakers: four mid-range drivers, six bass woofers and a pair of high-quality tweeters, for a level of audio specification that's far beyond anything you'll find built into a typical TV. The use of an external soundbar also means your audio experience benefits from having sound fired directly at you, instead of the rather 'swallowed' effect you get from the down-firing or even rear-firing speakers used by most LCD TVs. Wrapping up the 58DX802's important features is its 3D support. Delivered using the active shutter system, this will come as a relief to 3D fans upset by the 2016 abandonment of 3D by Samsung and Philips – although it should be noted that 3D glasses aren't supplied free with the TV.